Alex is excited to offer his alternative to the duo and solo packages to perform with his Party Band, ‘Rapped Up’. This band has a wealth of experience having played at various functions world wide. Why not add the WOW factor to your entertainment package. Creating the ultimate party experience with superior production, explosive sound and a natural ability to engage the crowd! The band is a collection a professional musicians who perform as solo acts as well as with the band. Because of this it means that the band doesn’t just have 1 lead member but a shared lead vocal role giving you different voices which suit each style differently and keeps each song sounding fresh. T he band will always feature Alex and Lewis Birtwell at the helm backed by a host of other great performers to make up this 5 piece Live line up! There is also an option to include live Saxophone to really add that sparkle. If you are worried about noise levels or your venue has a noise limiter in place, as much as we hate noise limiters, we are well equipped to work with them. Drums are always known as the troublesome instrument when controlling noise levels however not for us! We use a top of the range Roland Electric Drum Kit which gives us full control of the levels without comprising on the quality of sound. 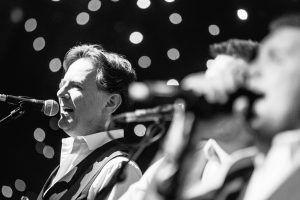 With a broad collection of rock anthems and pop classics taken from Alex’s own repertoire, your perfect musical soundtrack can be tailored to your event. Live First Dance Performance acoustically performed by Alex or the band (learnt and demo recorded if not featured on the song list). 2 Live Band Performances (around 45 minutes – 1 hour each). 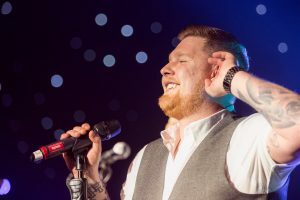 If you’ve already got a DJ included with your venue which you’d prefer to stick with, no problem, We can work with them making sure both DJ and Live performances compliment each other and work on a programme with you to make sure you get the evening party you want! For pricing and information visit the packages page or contact Alex today.